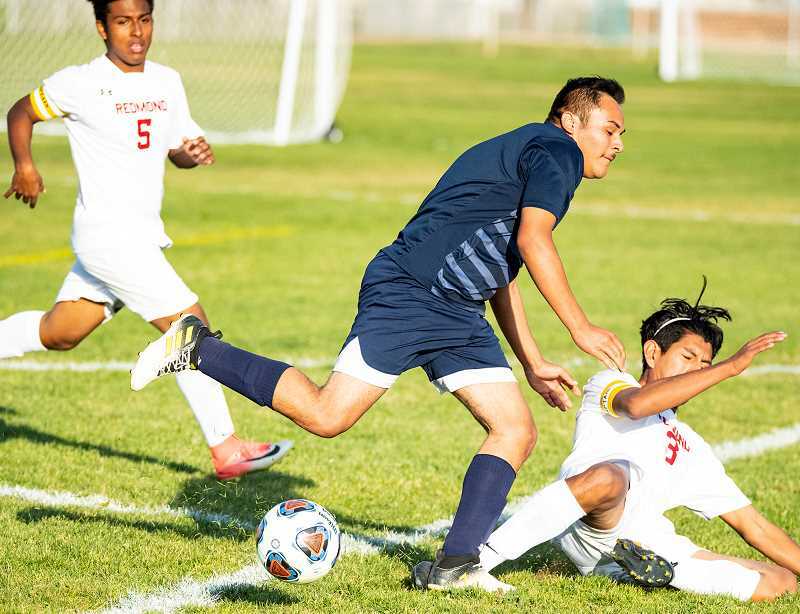 The Crook County Cowboys and Ridgeview Ravens played to a 3-3 tie Tuesday afternoon in an Intermountain Conference soccer match in Prineville. "We keep fighting because we want to win and we are all competitive," Crook County goalkeeper Pablo Casado said. "This match was hard because the other team played very well, and they had a very good forward. It was a very close match. We had the possession of the ball, but they had the chances. We could have done it better, but I'm not sad with the result." The Redmond Panthers jumped on top early when the Cowboys were called for a foul inside the penalty box less than four minutes into the match. Redmond's Owen Byrnes drove the penalty kick into the lower right side of the goal, and the Panthers had a 1-0 lead. Both teams had several opportunities to score during the early portion of the first half. However, neither team was able to put a shot on target. Then, 21 minutes into the half, Kevin Arroyo drove a ball toward the Redmond goal that went through Panther goalkeeper Ben Wheeler's legs for the game-tying goal. Four minutes later, Crook County took the lead when Redmond was called for a foul 25 meters out straight in front of the goal. Crook County's Jose Lorenzano took the free kick and drove the ball over Redmond's defenders and a leaping Wheeler into the top of the goal, giving the Cowboys a 2-1 lead. Although both teams continued to have scoring opportunities, the first half ended with the Cowboys clinging to a 2-1 lead. Redmond tied the match four minutes into the second half when Byrnes scored his second goal of the match. Two minutes later, Elias Villagomez earned a yellow card and was removed from the match. Although players re-enter a match following a yellow card, Villagomez did not return to play. His yellow card would be the first of a series of yellow cards given to the Cowboys during the course of the match. With Villagomez out of the match, the Cowboys rearranged their lineup, and the Panthers immediately took advantage with Byrnes scoring his third goal of the match just two minutes later. Following the goal, play was stopped for a period of time while the officials discussed how much time was left in the match. Eventually, the time clock was shut off, and the officials kept time for the remainder of the contest on the field of pay. When play resumed, Brogyn Miller-Sampson took a direct free kick for the Cowboys, which was stopped by Wheeler. Redmond counterattacked, and Moses Freauff was handed a yellow card for a penalty inside the Crook County penalty box, giving the Panthers their second penalty kick of the match. Byrnes took the shot, but this time, Crook County goalkeeper Pablo Casado made the save, preserving the tie. Then late in the contest, Jesse Sanchez scored the game-tying goal, taking a centering pass from Kevin Sanchez and driving it past Wheeler. Minutes later, the Cowboys had a free kick. Jesse Sanchez took the kick and centered the ball in front of the goal, where a leaping Kevin Sanchez just missed heading the ball. Instead, the ball sailed harmlessly past the goal, and the Panthers cleared it. With about eight minutes left in the match, Redmond took a free kick, but once again Casado made the save. Two consecutive corner kicks by the Panthers failed to lead to a score. Then the Cowboys took the ball upfield and had a scoring opportunity of their own. Instead of scoring, Kevin Sanchez was given a yellow card and removed from the match. On their next possession, the Cowboys pushed the ball ahead, and Jesse Sanchez took a shot, which rebounded off of Wheeler. Mitch Warren followed the shot and appeared to score, but the goal was disallowed when Warren was called for being off-sides. Redmond then drove down the field and Casado, and Byrnes collided near the front of the Crook County goal. Byrnes appeared to score, but once again the goal was disallowed. This time because a foul was called on Crook County prior to the shot. Miller-Sampson was subsequently given a yellow card for the foul, then was given a second yellow card and an automatic ejection from the match. Byrnes then lined up for his third penalty shot of the match, and once again, Casado was up to the challenge, stopping the shot and preserving the tie. 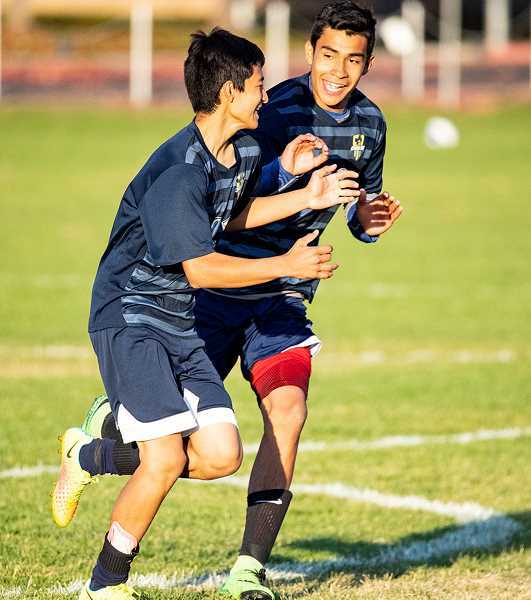 "It was exciting because you don't know where it is going to go," Casado, a foreign exchange student, said of stopping two penalty kicks in the match. "In Spain, there are not very many people watching the match in any sport, and here, people are very involved in that. When I miss, they say no matter, and when I make a stop, they are saying good job, so they are helping me, and it was very exciting." The Cowboys played the remainder of the match one player short due to the ejection. In the end, it didn't matter. As time ran out, the Cowboys had one final scoring opportunity. A Redmond defender was called for a foul on the play, but before the Cowboys could line up for one final direct free kick, time expired and the game ended in a draw. Following the match, Crook County assistant coach Ramon Castaneda told the team that he was satisfied with the outcome. "Hey, that was a good game," he told the team. "As long as we were fighting until the end of the game and no one gave up, that's good." With the tie, the Cowboys moved to 1-3-1 in conference play and 2-6-1 overall, while the Panthers are now 0-4-1 and 2-5-1. Next up for the Cowboys is a road trip to take on The Dalles/Dufur Riverhawks Thursday in a rematch of a game that the Riverhawks won 9-0 less than three weeks ago. Following Thursday's match against the Riverhawks, the Cowboys return home on Tuesday, Oct. 16 to take on the Hood River Valley Eagles. Both games are must wins for the Cowboys if they hope to make the playoffs. Hood River Valley, Ridgeview and The Dalles/Dufur are currently tied for first place in the conference with identical 3-0-2 league records. Crook County is currently in fourth place, three games back of the leaders, with five games remaining to play. Just three teams from the Intermountain Conference will make the playoffs. With such a large deficit to make up, the Cowboys have no margin for error should they hope to keep their slim playoff hopes alive.